Next year Mio Technology will celebrate its 5th anniversary, however company’s experience with Microsoft’s mobile operating system counts more than 5 years. Earlier devices had been developed and produced by the Taiwanese corporation MiTAC, then the development and production of handheld PC and smartphones were branched off into a separate company (Mio Technology). 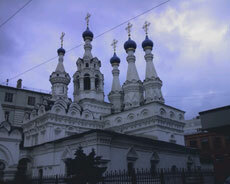 The company had been looking for its own style for a long time experimenting with smartphones and handheld computers. The products mostly failed. 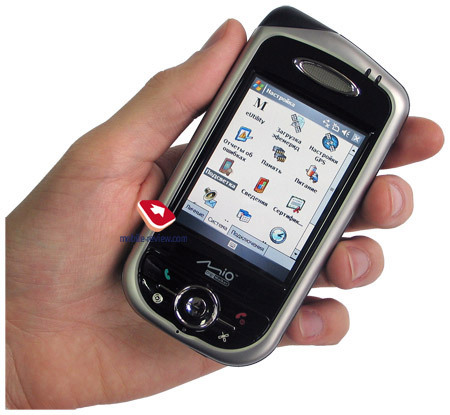 The crucial moment took place after the launch of Mio 168, the first Pocket PC with an integrated satellite receiver. This very model turned out to set the direction for the company. There were no competitors on the market at that time, so the company took the chance and occupied strong position on the market for satellite navigation. Mio is one of few companies demonstrating growing sales on the falling and vanishing PDA market. Quite logically, the company had been examining the communicator market from the very beginning and failed to release a GPS-communicator. You shouldn’t forget that the company tried to launch smartphones and had the experience in this sphere. 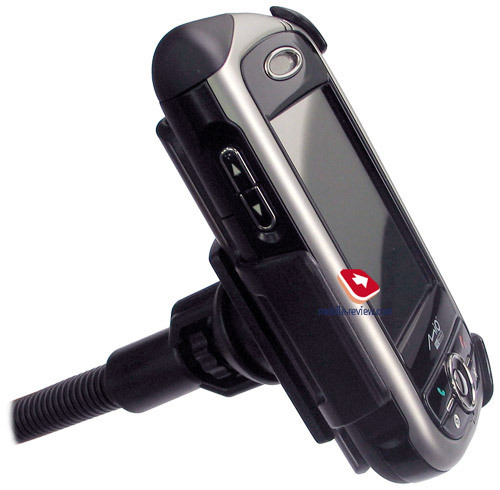 The development of the project under the codename Scoter took place in the late 2004, the first Mio communicator was unveiled at Computex 2005 in June 2005. Much later the model appeared in shops, as it took time to work on the hardware components. 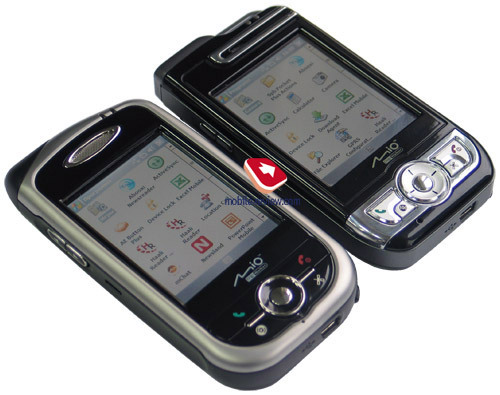 This wasn’t the first GPS-communicator, as HP managed to pioneer the market, besides E-Ten released its G500 at the same period. The model is available in two shell versions and three color solutions. 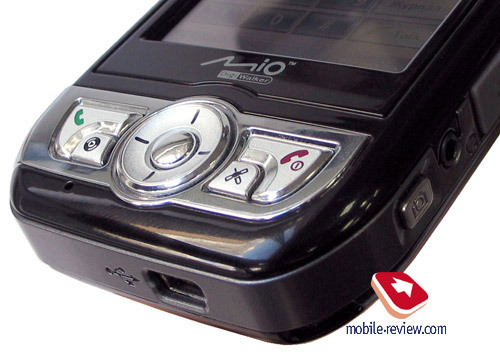 Initially there appeared Mio A700 communicator in glossy plastic (black or white color). 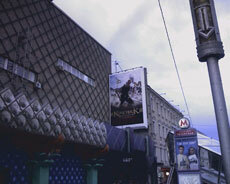 It looked typically Asian as it was designed for the Asian market. For its antenna design the communicator was dubbed the canister. 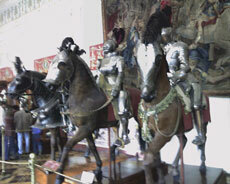 Despite of an unusual design the European distributors liked it and the model came out in Europe too. Many buyers find it attractive, I won’t argue on this subject, the device is really non-ordinary. 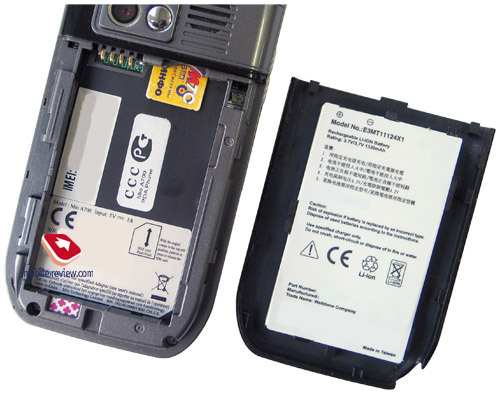 The main part of the shell (Mio A700) is made of a smooth glossy plastic, which catches dust and fingerprints. However that’s not that noticeable. 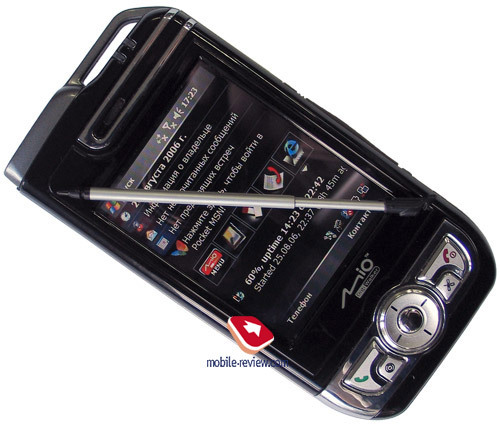 Mio A701, which followed Mio A700, has a plainer, lighter design with smooth lines. It doesn’t have elements for “design’s sake” like in Mio A700. As for my personal likes and dislikes design of Mio A701 appeals most to me than Mio A700, however the shell of the A701 is somewhat thicker, both versions are far from HTC P3300. But I’d repeat that design matters are subjective, everyone makes his own choice. The key and the only distinction between Mio A700 and A701 is design and shell material, other changes are of minor importance. So, we decided to speak about Mio A701 and add some stipulations if necessary. A701 is made of a high quality uneven plastic. There is little of glossy black plastic around the screen and the camera, besides the front panel buttons are made of it. Surprisingly the assembly quality is high, there is no backlash, which makes good overall impression. This is a positive change, especially if we remember old Mio models featuring poor assembly quality. 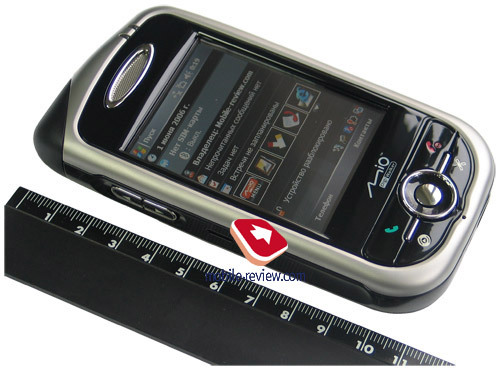 Due to compact size and grooves at sides the device lies comfortably in hand. This isn’t the smallest or lightest one on the market, but if we consider devices with the integrated GPS, it is the second after HTC P3300. HP iPaq hw6500: 118x71x21 mm, weight – 165 g.
As we’ve mentioned the development had started long before the announcement and availability for vendors of WM 5.0 operating system. That is why there aren’t special buttons for single-handed operations in WM 5.0 (two soft buttons, OK and Start buttons). This is a flaw in ergonomics. On the other hand, you can use special programs and assign these special actions to hardware buttons. 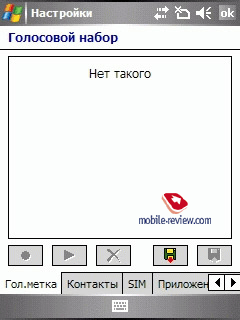 Under the screen we see big buttons – Talk and End, and two more buttons (Windows Media Player and navigation) attached below them. 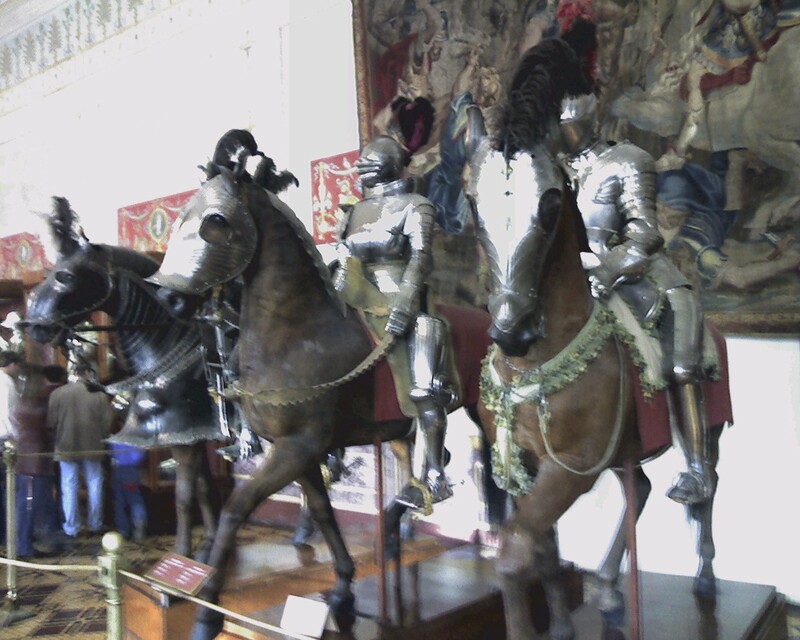 It’s possible to reassign them by standard means or exterior utilities. The joystick is quite hard, however it copes well with its functions. Above the screen we find a phone speaker and two LEDs. 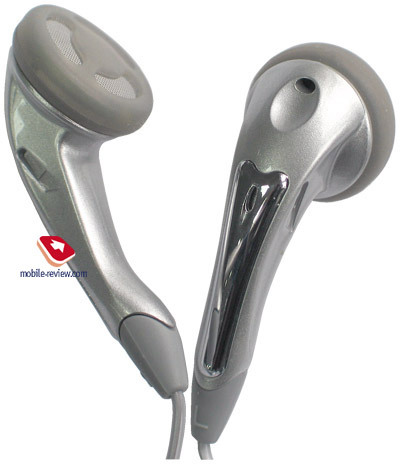 A dual sound volume button is located at the left side. There is nothing on the top except for a prominent GPS-antenna and a lace hole. At the bottom end is the standard connector for synchronization or charging. Besides there is a silo for the stylus pen. The latter is telescopic and quite small, not that comfortable if compare with the analogs. 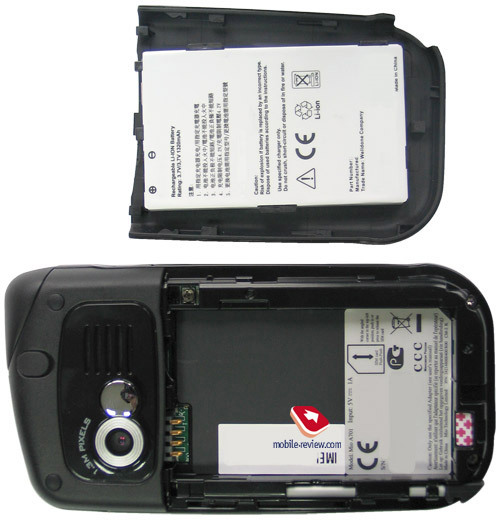 At the back panel we see a camera, a speaker of average sound volume and a battery cover. 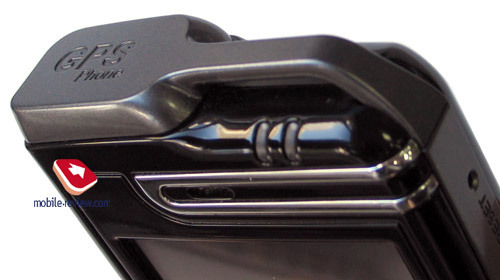 The right side is crowded with elements – camera, soft reset buttons, SD/MMC slot and headphones jack. The official specs specify that the A701 supports up to 2 GB cards. This isn’t true in fact, the communicator works perfectly with higher capacity cards. I’d note this is one of the last full size Secure Digital cards, other models are gradually switched to microSD, as this format can spare space inside. Standard headphones from the kit can do little, as usual, they offer average sound quality. For a better sound you can plug your own headphones via an adapter (not included in the kit). So, just buy a high capacity SD card and a 2.5 mm adapter and enjoy the music. Traditionally we have to repeat the same words concerning screens in new Windows Mobile communicators, as the specs are almost always the same with a rare exception. The A701 is equipped with a typical display, with typical dimensions and resolution. 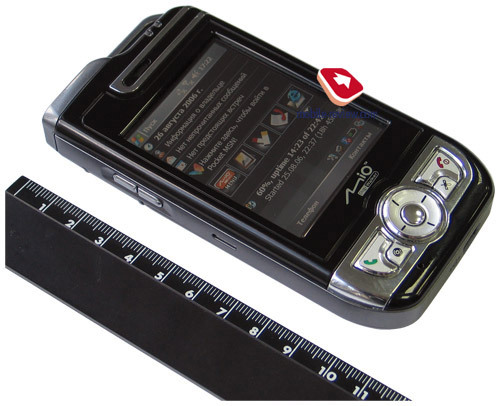 The diagonal is 2.72” (active zone – 41x54.5 mm), resolution – 320x240 pixels, colors – 65K. The screen has good viewing angles, the text and the image don’t get distorted even at a zero angle. There are 11 backlight levels. The minimum backlight level is convenient to work in the dark. You can work with the maximum backlight level even in a bright sunny day, the text is readable, however the image gets faded away. 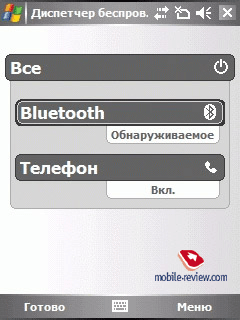 On the whole we have a typical screen for a Windows Mobile communicator. It stands out only for its good viewing angles and the minimum backlight level. The device comes with a Li-Ion 1320 mAh onboard. In the specifications we read about 4 hours of talks and 8 days standby. However in reality the results are lower. In average the device lasts for 1.5-2 days (30-40 minutes of talks per day, e-mail check every 30 minutes on the schedule, 30 minutes of the Internet surf, 20 minutes of organizer functions). 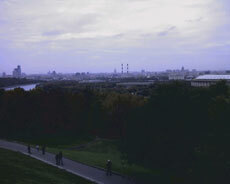 If you use GPS several hours per day and listen to the music, the device is good for a day. 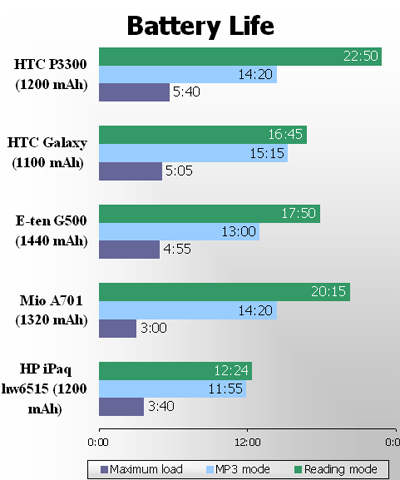 Our standard battery life tests revealed average results. In the e-book mode (the minimum backlight level, auto scroll in Haali Reader) the A701 worked for 20 hours due to low power consumption on the minimum backlight level. In the MP3 mode (MP3 playback at 128 kbps bitrate from the storage card, the screen if off) the battery got drained out in 14 hours 20 minutes. Under the maximum load (video playback from the storage card, the maximum backlight level) the A701 lasted for 3 hours sharp. 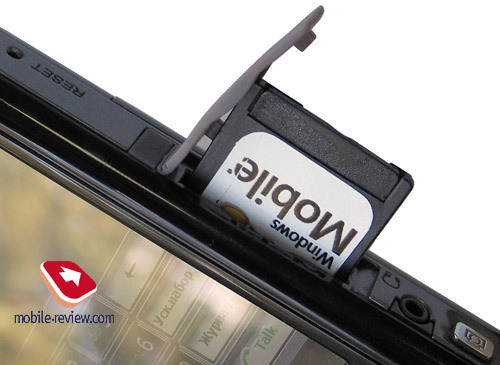 There is quite a standard SIM-card mount. 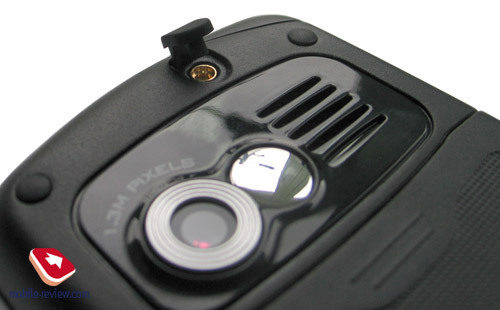 The communicator is equipped with a 1.3-megapixel camera (the highest resolution – 1024x1280 pixels). 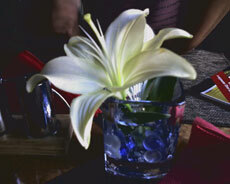 There isn’t a macro mode, auto focus or flash. 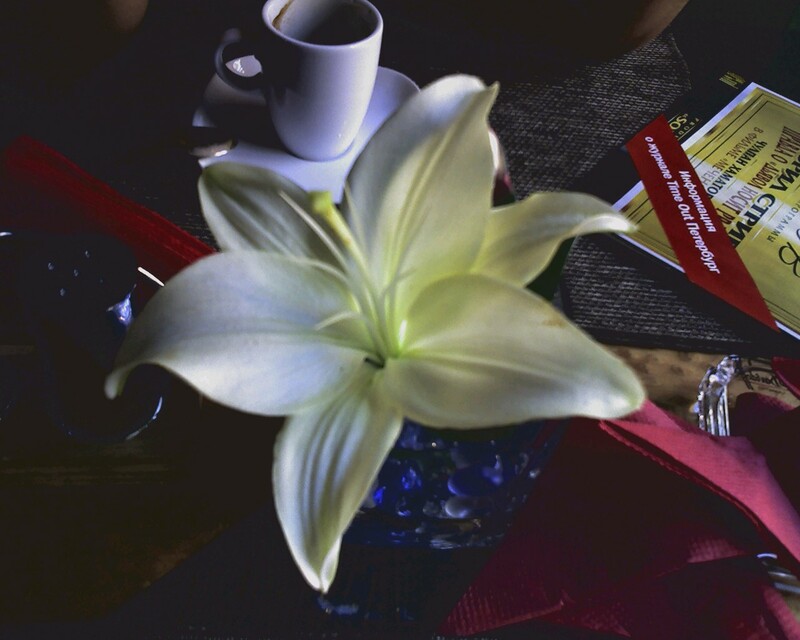 At the moment we can seriously discuss camera quality starting from 2-megapixel resolution. The photos shot with the camera feature average quality, they don’t arise any emotions when displayed on the screen of the communicator or PC. 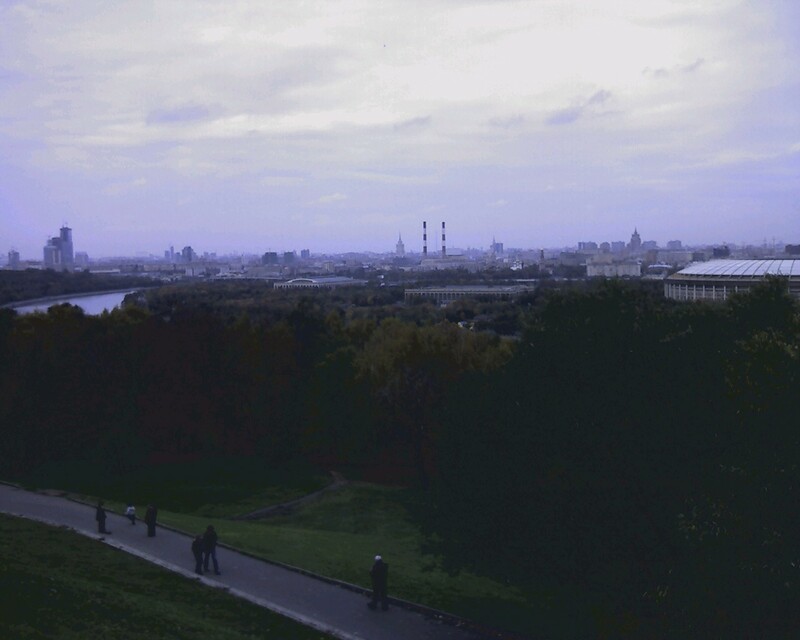 The camera is operated by an application built in Windows Mobile 5.0. 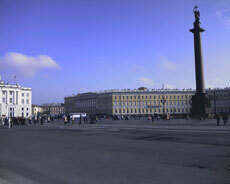 Video can be recorded at the maximum resolution of 320x240 pixels in WMV or H.263 formats. Satellite navigation was the key means of development for Mio several years ago and now too it encourages company’s steps ahead. 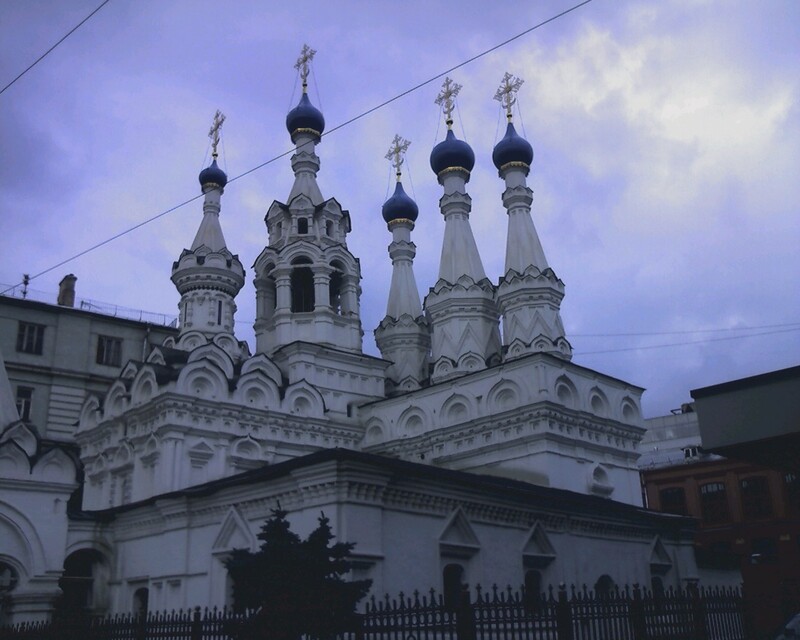 The company can boast of rich experience in the GPS sphere. 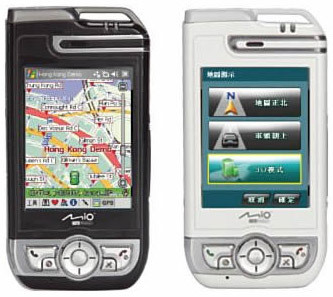 It would have been a mistake to think that the level of GPS implementation in the first Mio communicator would be lower compared to competitors. 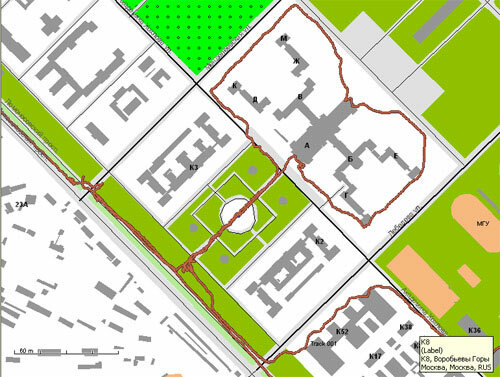 Great number of experiments revealed that Mio A701 can be considered the etalon of GPS implementation in a communicator. The device comes with an integrated SiRF Star III GPS-chip, we meet this chip in most devices with the satellite receiver. However Mio Technology is the first maker, which applied this chip in its communicator. It seems that all GPS models should feature similar accuracy and performance. But the situation is different in reality. The module should be built in the motherboard, adjusted correctly, the GPS-antenna needs to be positioned and shielded well, not many succeed with the process. We tried navigation with Destinator TomTom 6 (in car) and GIS Russa (walking), the accuracy level was high in both cases. 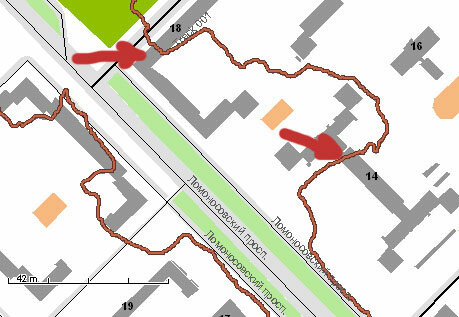 The track recorded with GIS Russa describes accurately enough the real route around the Moscow State Linguistic University. Passing through obstacles with short signal loss (bridges, arches) almost don’t affect the positioning accuracy, the coordinates do not “walk” in difficult situation like in many other devices. 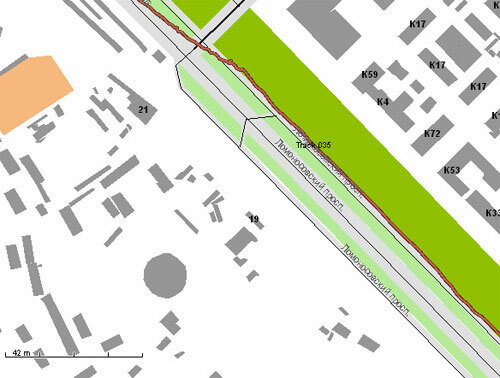 The typical positioning error lies within 7-10 meters, which is even excessive for the car navigation and acceptable for walking navigation. I’d note that the communicator worked for 6 hours 5 minutes with GPS on an average backlight (HTC P3300 lasted for 7 hours 25 minutes), that’s a good result. If you find it insufficient, use the car charger. There is one unpleasant moment in GPS use, I mean TTFF (Time to First Fix), it can take several minutes or even several dozens of minutes, if you are in motion. In Mio A701 the problem is solved with Quick Position utility, which downloads all necessary data via the Internet. This data is valid for 3 days, and the TTFF takes up to 10 seconds. It really works and simplifies the operation. Let’s not forget that the kit contains a car holder, a car charger and a navigation program, i.e. you have everything necessary for car navigation. Just open the box and use the communicator, you don’t have to buy anything extra. 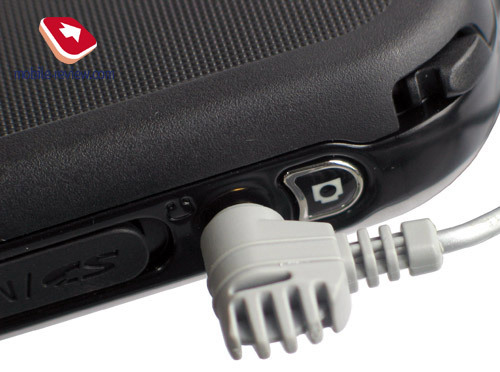 The long development process resulted in the lack of Wi-Fi adapter (almost all new models support this wireless standard), there is no support of EDGE and IrDA. 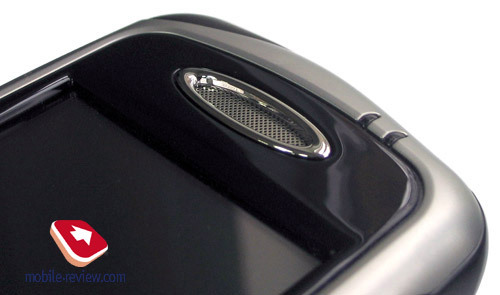 The infrared port is gradually vanishing in new models, the manufacturers do not consider it necessary. We can’t treat the lack of EDGE as a serious drawback. The only bad moment is the absence of Wi-Fi, however it can be solved with a SDIO expansion card. 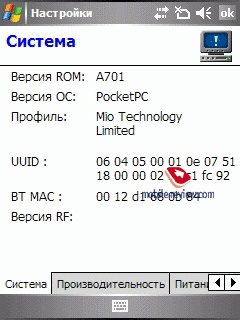 Mio A701 has Bluetooth 1.2 adapter. The module is controlled by the standard Microsoft stack. Let’s see which profiles are implemented and what they are for. Serial Port Profile (SPP) emulates a COM-connection of devices. It is used for PC synchronization, connection of external Bluetooth-devices, for example, a Bluetooth GPS-receiver. Object Push Profile (OPP). 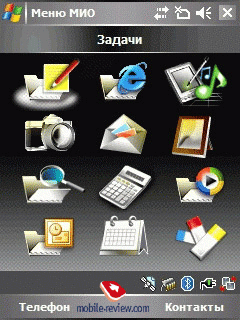 It is used to transfer objects, for example, calendar entries and contacts. Hands-Free Profile (HFP). 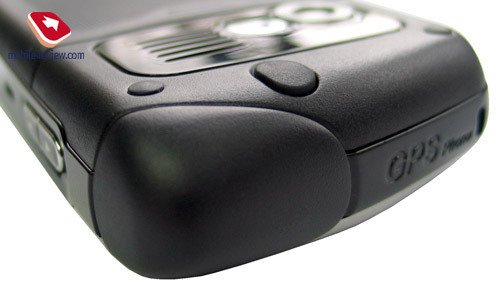 Connection of a Bluetooth-headset, a speakerphone. Human Interface Device Profile (HID). Connection of a Bluetooth-keyboard. Dial-Up Networking Profile (DUN) to use the communicator as the modem, to access the Internet. Alas, that’s all, there is neither stereo Bluetooth (A2DP) nor FTP. Well, the device can’t boast of plenty of wireless profiles. On a USB connection it’s possible to use the device as the storage drive and work with it like with the card reader (drivers not required). Mio A701 is powered by Intel XScale PXA 270 520 MHz processor. 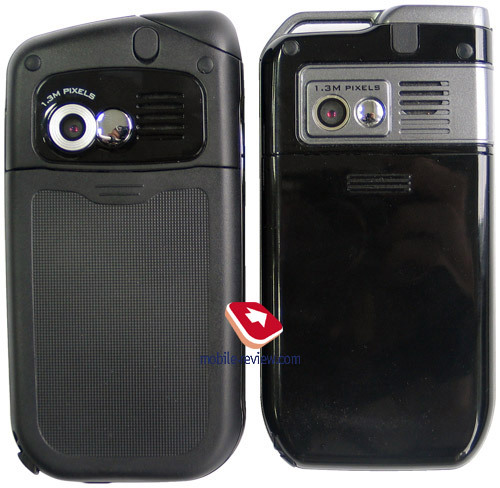 The user can access 50.42 MB of 64 MB RAM and 64.09 MB of 128 MB flash ROM (to store user’s data). RAM size is enough in most cases, flash ROM size isn’t that important if you use a storage card. 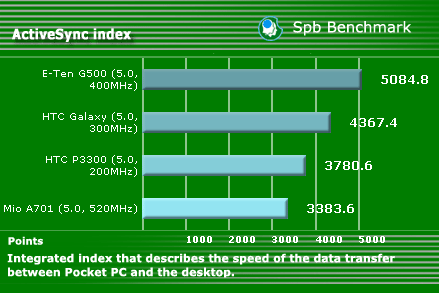 Traditionally we start our productivity test with SPB Benchmark package. With time the package is getting out of date, even if we compare the devices on the same Windows Mobile version. 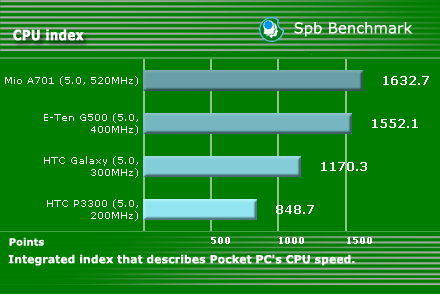 Let’s pick up several devices with similar specs for our comparison. The CPU index describes productivity of the CPU. Mio A701 is on the top. 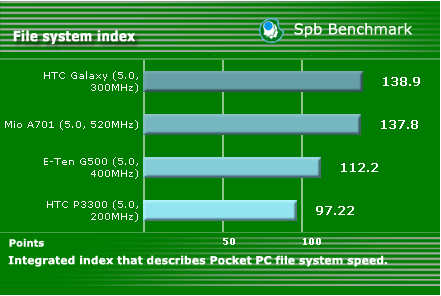 This integrated index describes Pocket PC file system speed (read/write/replace). Here again the device performs well. The synchronization speed is average. We won’t provide the total index, as it is distorted for Windows Mobile 5.0. We tested video with The Core Pocket Media Player program (ex. 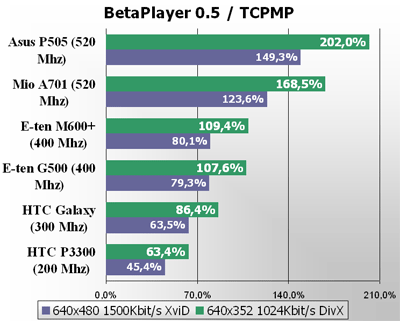 BetaPlayer) and got the following results. The productivity depends greatly on graphical accelerators and Wireless MMX, which is built in the latest Intel XScale processor. 100% performance means the movie runs without dropped frames, smoothly, however there might be failures during active scenes. Thus Mio A701 doesn’t require converting movies into MP4, you have to record the movie and watch it. Even if we level the influence of accelerators and Wireless MMX, the communicator is still performing well. we launched 4 clips at different stream intensity, the index was formed on the basis of dropped frames. The less dropped frames, the higher the index is. 1000 index means no dropped frames at all. 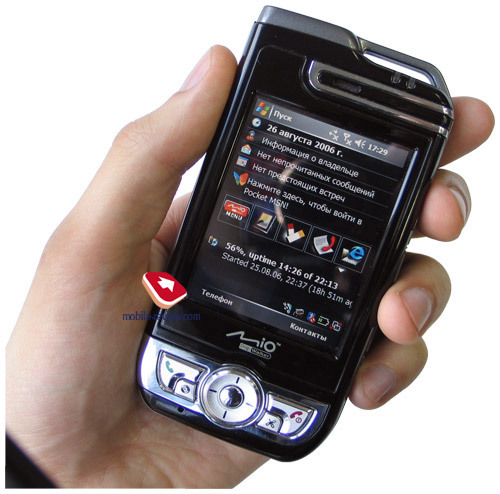 On the whole, Mio A701 turned out to be one of the most productive models among communicators and PDAs. In reality its productivity will be useful for games and video playback. 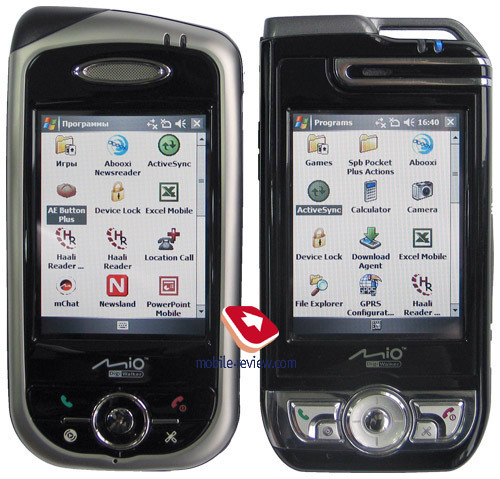 Mio A701 is powered by Windows Mobile 5.0 for Pocket PC AKU 2.3. The communicator involves built-in russification by Microsoft (unlike Mio A700 with the russification by Paragon). You can read the detailed review of Windows Mobile 5.0 and AKU update package in separate articles on our site. Here we’ll tell you about extra preinstalled programs. The list of extra built-in programs (in addition to distributor’s programs) contains several utilities to work with GPS (sending coordinates via SMS) and for quick positioning. 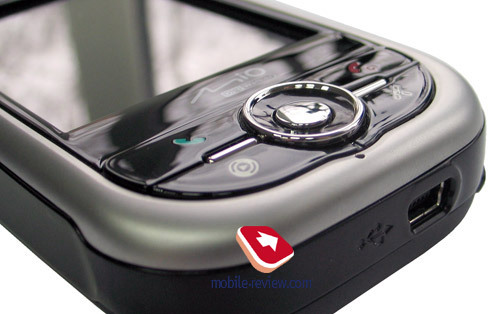 There is a voice dialing program by Cyberon and a simple quick launch menu by Mio. Mio A701 is supplied to the Russian market with DestinAtor 6 (maps of Moscow and Saint Peterburg), this is definitely a considerable advantage. 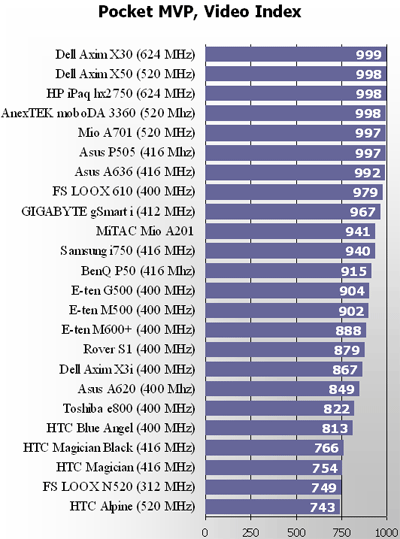 The network reception quality of Mio A701 is average. The ring volume isn’t too loud, you can miss it in a noise situation. The vibrating alert is also average. 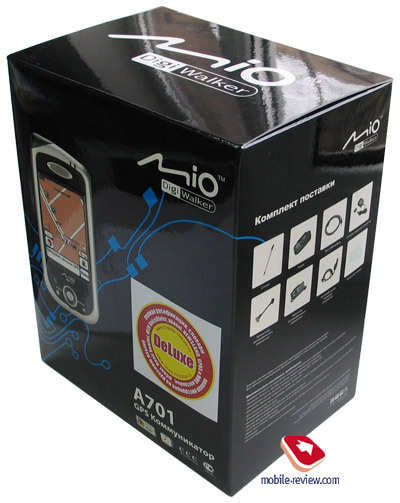 Mio A701 is the first communicator by Mio Technology, however with the first model the company set the etalon of GPS implementation in communicators (positioning accuracy and stability, power consumption, quick positioning function). But the competitors stay awake, by the beginning of the next year there will be 7-8 Windows Mobile communicators with built-in GPS – a good choice. 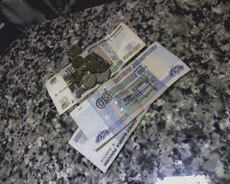 The retail price of the package with DestinAtor in Moscow makes up some $760. The users in Europe can buy Mio A701 with Mio Maps for $825, without maps – for $700. The communicator has the following strong points – perfect implementation of GPS, rich sales package (with DestinAtor), high productivity performance. As for the weak points, they are average battery life time, flaws in ergonomics (no separate soft buttons, no power button), the lack of Wi-Fi and EDGE, poor Bluetooth functionality (no support of A2DP profile). 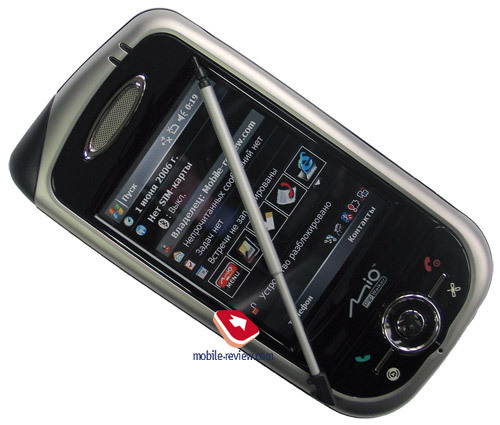 The next model to come out in the beginning of 2007 will be called Mio A500. We’ll see smaller dimensions, changed control elements, the support of Wi-Fi.